Ah, even after years of programming in Delphi, there’s still something new I learn every day (lucky me). Just recently I needed to have hints (help tooltips) for some buttons to stay visible longer than hints for other controls (like edits, memos and alike). Hints are defined using the Hint property every TControl descendant exposes. Hint property is a string value specifying the text that appears when users move (and stop) the mouse over the control. Usually you would use hints to provide some more info about the underlying control (imagine a button on a toolbar and a hint providing more details / help to what the button does). The ShowHint property then determines if the Hint text appears for the control – it is False by default. The actual display of the hints is under the Application control (global object controlling your Delphi application). The global Application object of type TApplication also has the ShowHint and Hint properties. By default, ShowHint for Application is true. The Hint property stores the Hint value of the control when the mouse is moving over the control. 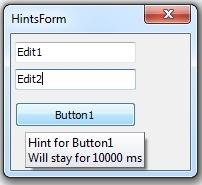 HintColor – specifies the color of the hint boxes for the Hints for the application. Default is clInfoBk. HintPause – specifies the time interval in milliseconds that passes before the control’s Hint appears when the user places the mouse pointer on a control. HintShortPuase – specifies the time in milliseconds to wait before bringing up a Hint if another Hint has already been shown. By looking at the above, I would like to have HintHidePuase be longer for some specific controls in my application. If I set Application.HintHidePause = 10000 then all controls will display their hints longer – therefore a no go. Just to mention: each Hint can actually have two parts: short and long – separated using the pipe “|” character. Short hints are what gets displayed in the pop-up window. The “long” part of the Hint is displayed by the TStatusBar control. Use the GetShortHint and GetLongHint function to extract short and long parts from the Hint value. If there’s no “|” in Hint, long value is an empty string. Now, there’s the TApplicationEvents component you can drop on a form. The TApplicationEvents wraps up events of the global Application object. The TApplicationEvents has two interesting hint-related events: OnHint and OnShowHint. The OnHint event is of the “standard” TNotifyEvent type. From the OnHint event you can read Application.Hint and eventually alter or display it somewhere also (like in a status bar). The HintStr is the text of the hint. The CanShow is the last moment to permit or prevent the hint for displaying. The HintInfo is what I’m looking for! The HintInfo parameter contains information about the appearance and behavior of the popup window. Changing its fields will customize the way the Hint is displayed! HintControl – the control for which hint processing is occurring. HideTimeout field – the number of milliseconds to show the hint. By default, it is set to the value of the Application variable’s HintHidePause property. Finally, if you’ve come so far, here’s a short code example. Run this and note that the popup window with the hint will stay visible for 10 seconds if you place your mouse over the button(s) and do not move it. A confession: in my real application I needed to have longer visible hints for the nodes of the virtual tree view. This entry was posted in delphi and tagged Application, Hints, TApplicationEvents, TStatusBar on February 19, 2013 by zarkogajic. Interesting. Timing appears to work as described. Yes – that got it! So, how do you get the hint of Minimize, Maximize and Close button?